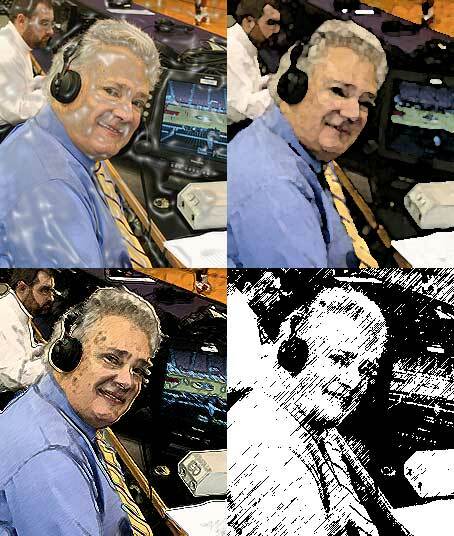 Eye On Sports Media: Is Tom Hammond Black or White? Is Tom Hammond Black or White? From Nashville, TN: Is Tom Hammond Black or White? From Evanston, IL: Is Tom Hammond Half Black? From Unknown: is tom hammond the commentator black? and there were many more like this. Image Copyright 2008 by Eye on Sports Media/The Cayuga Group, LLC. The only response, besides profound sadness that race should matter, is who cares and why should it matter? Tom Hammond is a very skilled and talented broadcaster and it should not matter what his race is or is not. In our house, it did not matter that Ato Boldon was black or white. It mattered that he was a Trini playing a major part in a United States broadcast, and he did an excellent job. Hammond was born and raised in Kentucky and went to the University of Kentucky. So he probably bleeds Kentucky blue. But I doubt he is one of the blue people of Kentucky. He has curly hair. One would have thought that in sports, of all places, race should not matter. But it does to some extent as minorities have been traditionally underrepresented in news rooms and on the air. But the questions that people were Googling just make no sense on their face. And I hope that people who come to this page from these searches might answer the question why by posting thier comments. Yes, this is article is Google bait because I for one would really like to know the intentions behind these questions. It's called curiosity, and there is nothing wrong with that. You know, it is possible to ask a question without having any ulterior motives, especially with a question as trivial as this. I asked this same question because I genuinely wanted to know the answer, regardless of what it may be. Instead, I get you telling me race shouldn't matter. I know this, however I still want to know what race the guy is out of sheer curiosity.